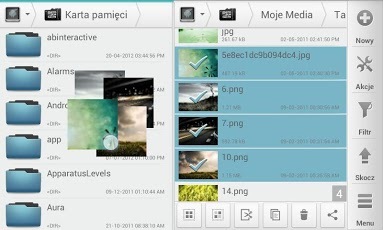 All of us who have Android devices have used a variety of file managers and explorers to browse files. Most of these file managers let us perform the usual file operations such as copy, move and delete. File managers are generally restricted to browsing local files only. Imagine a file manager in which you could just drag and drop files anywhere to copy something, no matter where your files are. With Solid Explorer Beta, you can do more than that. Solid Explorer Beta is a file explorer and manager that can smoothly browse through your files in your local storage (SD Card), your personal cloud storage or anywhere on the internet. It has two independent browser panels, so you can browse two locations simultaneously and move files from one location to the other in no time. In Portrait mode, only one panel is visible on screen at a time. Switching between panels is possible by swiping the panels left or right In Landscape mode, both browser panels appear side by side. File operations can be performed by dragging folders and files from one location to the other – even across panels. Just hold down the file/folder (icon) you want to copy/move and release it somewhere else and your file will be copied/moved. If you are in portrait mode, jut drag the file to the edge of the screen (right or left) to reveal the alternate file browser panel. Files can be selected by tapping on them. A menu appears when you click and hold the file revealing various file operation options. You can also enable other options to this menu in Settings. You can also search for particular files using the app’s search option. Searches are indexed so results are returned pretty fast. It takes almost less than a second to search for a particular file that’s on your phone. What’s more, you can also search your device on Google using Solid Explorer. Just go to the Google App’s Search Settings and enable Solid Explorer. This is the feature that sets Solid Explorer (Beta) apart from rest of the File Managers out there. In addition to the files on your local device, Solid Explorer can also explore your files on the Internet. Solid Explorer Beta supports FTP, SFTP and SMB protocols. This means you can access files on a remote server/computer by logging into it remotely. Each time you log in to a new system using the above protocols, your credentials are automatically bookmarked. You can also protect your passwords with a single master password. If you own any cloud storage account (like Dropbox), you can also log into them and browse the files on Solid Explorer Beta. Solid Explorer Beta can also create archive files from a group of folders and files. Archiving helps you to easily attach multiple files/folders and sending them via email. Solid Explorer Beta supports archiving files in ZIP, RAR, or TAR formats. Similarly, you can also open archive files and explore its contents just like you would open a folder to browse it. Solid Explorer Beta is an all-in-one File Manager and Explorer that will gives you complete control over your files. It gives you fast access to all your files and you can easily move them around. It even brings your files in the cloud right at your fingertips. Download Solid Explorer Beta on Google Play!